One early October morning I am driving in the plains just north of the Talek River in the Western Mara when a small carnivore jumps on a termite mound in the distance. I don’t recognize it at first. I think of a Jackal but as I put my binoculars to my eyes I almost can’t believe what I am seeing. It’s a Caracal, the most elusive, shy, mysterious, invisible cat in Africa. It’s my first ever sighting of this magnificent animal. Soon after another Caracal appears walking through the grass; the first one descends the mound and follows the other. It's a mother with her almost full grown cub. I cautiously get close and they disappear in the tall grass. They have melted away. It takes me a lot of scanning with the binoculars to find them hidden in the grass, only the black tufts of their ears visible. As another vehicle approaches, they disappear into a hole in the ground. In the afternoon I am back in the area, hoping for another glimpse and maybe a decent photo opportunity. The track runs not far from the hole where they entered. I stop and scan the surrounding area. Nothing. I drive on for a few hundred meters on the track, looking intently in all directions. Then I drive back up the same road and I stop near the hole again. I decide to wait here hoping they are still in and that later they'll come out. Or maybe I might spot them somewhere in the plains not far when the temperature drops further. It's a rather cool and cloudy afternoon. Only after a few minutes I realize that one of the two Caracals, the mother, is sitting completely relaxed just a few meters away from my car, and she is looking at me with her wonderful, haunting look. I take a few images with my hands shaking in emotion, trying to make as little noise and movement as possible. It doesn't even seem possible that all of this is really happening. Her cub soon joins her. He is very active exploring his surroundings, chasing birds and butterflies, munching twigs or leaves. Suddenly I hear another vehicle coming on the track. Mother Caracal hears it too. She returns to the hole. I am afraid it's all over, that they might stay in until dark. The vehicle drives on without stopping, and immediately after the Caracals come back out, she lays down more or less in the same spot. The cub resumes playing. For the rest of the afternoon they remain out in the open, in full view. At one point the cub walks even closer to my vehicle, looking at me with his curious eyes wide open to the world. It’s a dream come true. 20" x 30", 30" x 40", 40" x 60"
I am heading across the Burrungat plains one early morning to reach a small river that crosses the eastern Mara, the Ol Keju Rongai. It’s the home of a young female Leopard that I have been following closely for a few months. She is named Lorian. She is about two years old now, her mother occupies a territory just nearby. 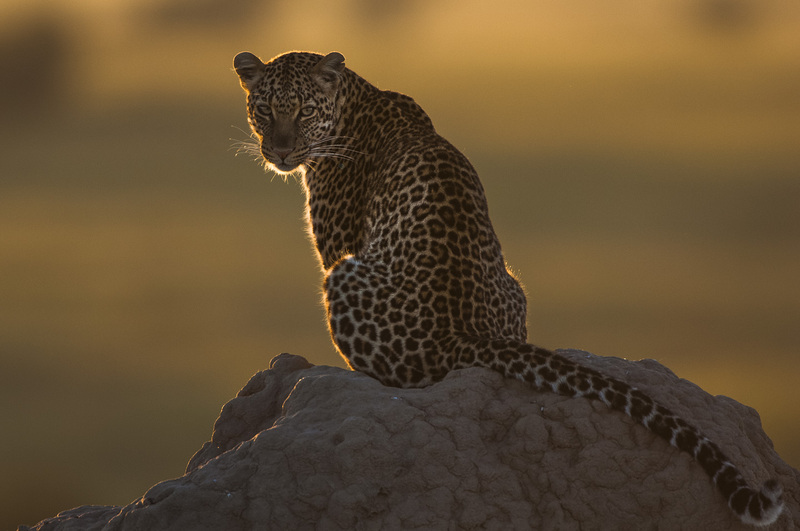 Young Leopards become independent and able to fend for themselves at about sixteen months of age but they often remain near their mother’s territory. They still take advantage of their mother’s kills sometimes. But for Lorian finding food is not a problem. She is an exceptional killer and it’s not rare to see two or three preys scattered on different trees in her area at the same time. Today she has a kill on a solitary tree in the middle of the plains. As I drive closer, I spot her basking in the rising sun on a termite mound just below the tree. The sun climbs, she turns around to look at me, before going up the tree to feed. The Leopardess Olive and her two male cubs have just finished consuming a kill in the riverine forest along the Talek river in the heart of the Mara. I am up in the darkness, driving through the plains to reach the spot where I left them last night. I see them from a distance sitting up on a fallen log just on the river edge. 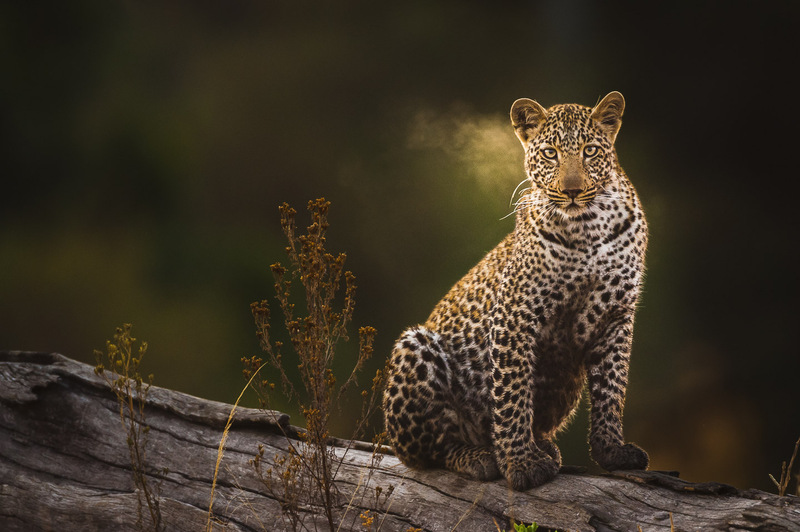 It's a cold morning in July, the Leopard's breath backlight is clearly visible against the dark forest behind them as the pre-dawn light shines in the sky in the east. 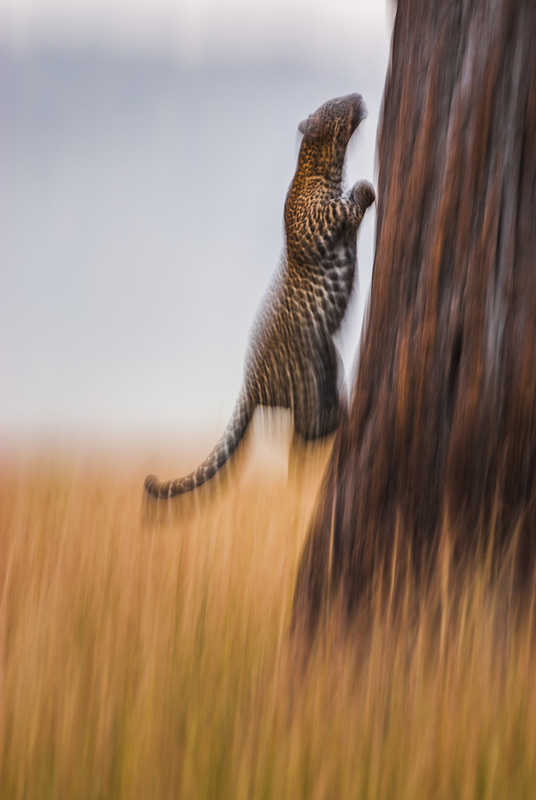 Leopards are such secretive creature, constantly living in hiding. 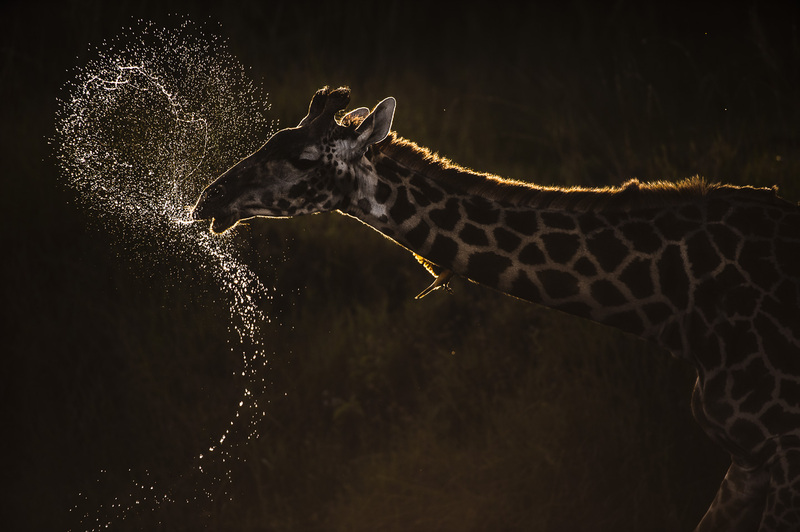 Moments such as this rarely occur in the wild, and when it happens the emotion can be overwhelming. 20" x 30", 30" x 40"
The sun is almost setting behind the hills in the west. After leaving the three males and five females resting on the kopje I drove for hours into the open plains of the southern Serengeti. There's no other vehicle, only endless grass filled with millions of herbivores everywhere. More kopjes rise in the distance, and almost each one of them has one or more Lions from different prides. In the plains I find a mother Cheetah with three cubs, I follow them hunting a young Grant's Gazelle. In the afternoon I return to where I left the males in the morning. They are waking up just now. One of the three climbs the top of the rock, the falling light paints his coat fiery red. He looks down to his kingdom, with the Wildbeests' herds in the distance, the Elands walking through the plains, with the wind blowing through his light mane. After the sun has set the Lionesses descend towards the herds, he nonchalantly keeps an eye on them. I am alone in this seemingly eternal moment, and I have a clear feeling of being in the most beautiful place on earth. Lake Nakuru NP is a sanctuary for Rhinoceroses. Both Black and White Rhinos have been reintroduced respectively from South Africa and from other parks of Kenya where they were severly threatened by indiscriminate poaching in the 1980's for their horn. Both species found an ideal habitat here and have reproduced very well, so much so that many have been relocated from here to other sanctuaries in the country. 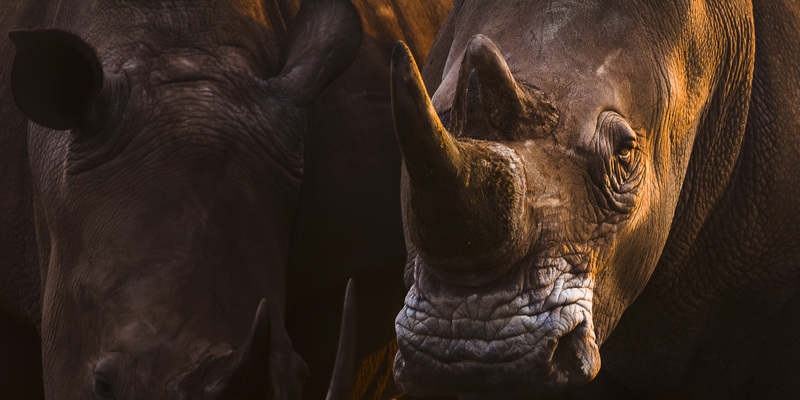 Unfortunately, after about fifteen years of relative peace when poaching had come down significantly, since 2007demand for Rhino horn is peaking again from the Far East. This has sparked again heavy poaching on Rhinos throughout Africa. 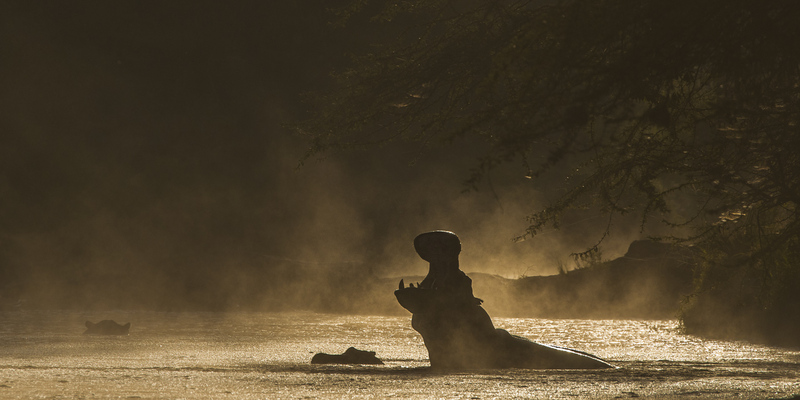 I watch these magnificent giants in the low morning light, as they rest on the lake shore, seemingly unaware of how much their existence on this planet is at risk. All due to humans' greed. In Asia it is believed that the Rhino horn has medicinal and aphrodisiac properties, but scientific research has proven that it is totally false. Nowadays Rhino horn is mostly sought after for its investment value, as its price is close to that of pure gold. In the grass among the Acacias I find a honeymooning couple of Lions one afternoon in September. They sleep and wake up to mate approximately every thirty minutes. I am quite far from the scene and I can't take and interesting image. Suddenly, from deep in the forest a herd of White Rhinoceroses appears, walking straight to where the Lions are. As soon as the Rhinos realize their presence they charge. The two Lions run towards me up the closest tree. The Lioness easily climbs to the higher branches, but the male looks a bit uncomfortable and he stops on the lower branch. 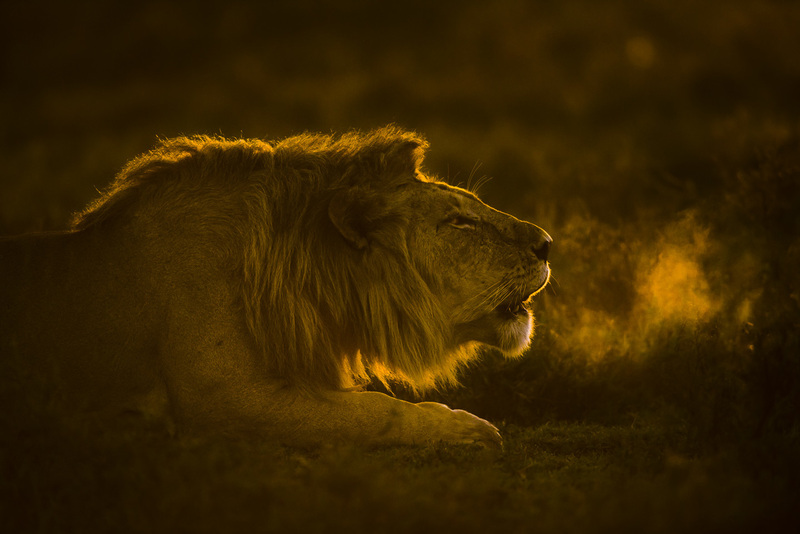 As the Rhinos walk on, satisfied of having gotten rid of the predators, the male Lion descends right away and faithfully awaits for the female who watches him from above. As dark clouds fill the sky above me a cold wind picks up and shakes the long stems of grass on a January afternoon. The day has been hot, humid, silent. But now I can smell the rain, I can feel it coming. So do the Lions. They wake up from their sleep. There are two males here, five females and eight cubs of about nine months of age scattered in the plains. 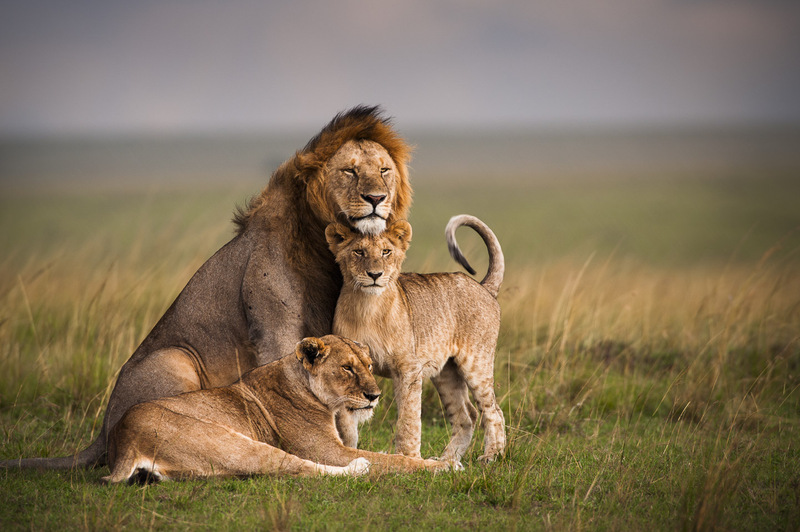 Lions are the only felines who live in groups, and this enables them to hunt the large herbivores that inhabit the plains and bushes of Africa. Females tend to stay in their natal territory while males are chased at about two years of age. They become nomadic wanderers until they are strong enough to chase other males from a territory and make it their own. 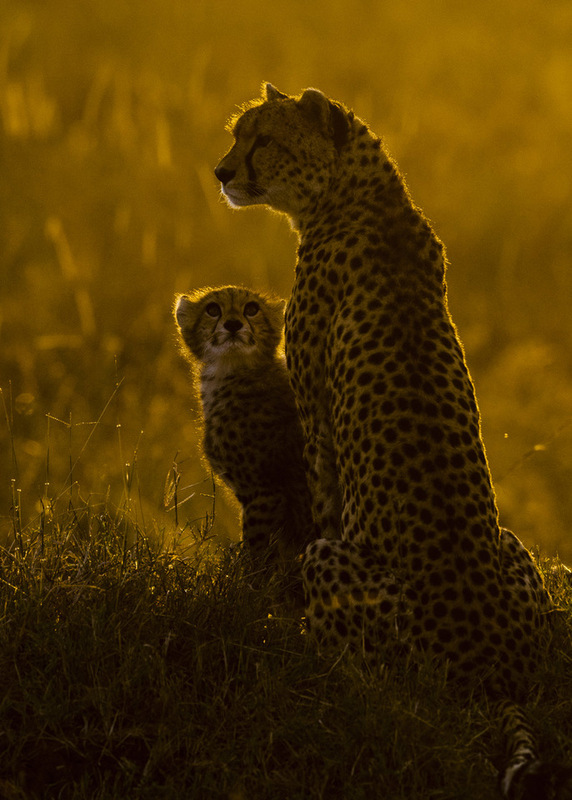 Now one male sits up next to a female, one of the cubs joins them as they look into the distance and smell the air. The wind shakes the male's beautiful mane. End of July of a particularly dry year in the Mara. 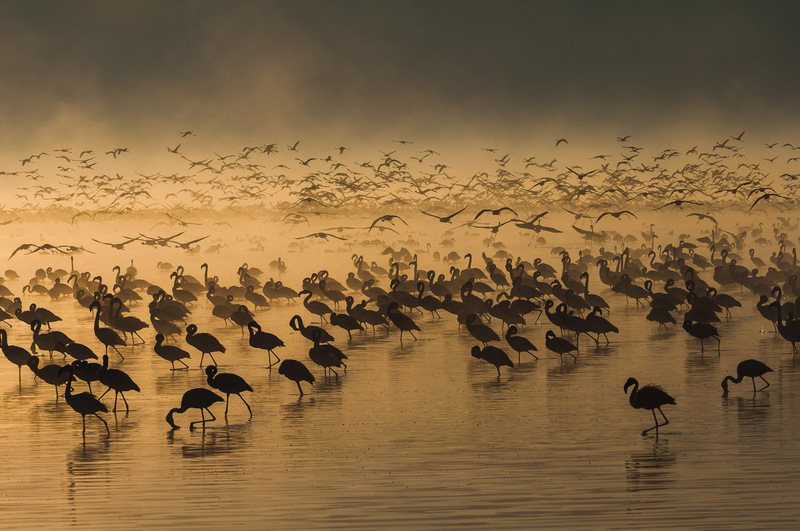 The long rains have been very scarce and the migration has already reached here a month ago. I am parked on the edge of a bush where the Lions spent the day. 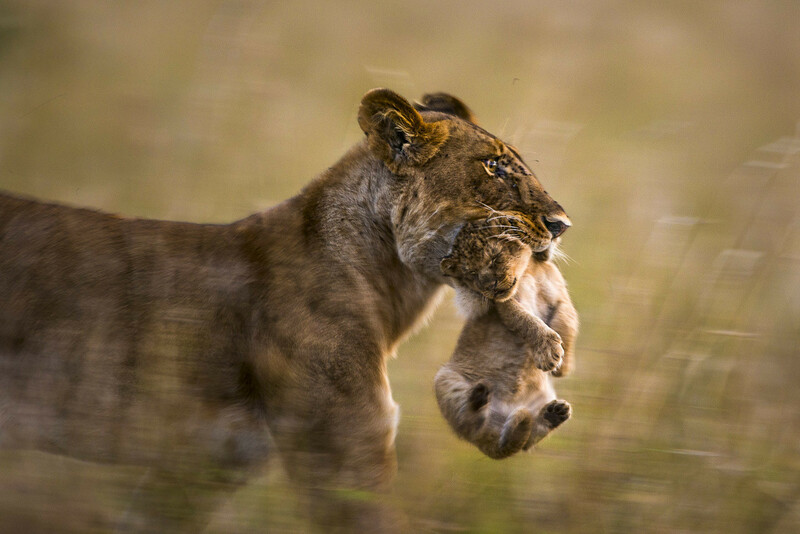 The Lionesses of this group have given birth to three litters of cubs since the beginning of the year. The smallest ones are barely eight weeks old. The older cubs are playing on a fallen log under the watchful eye of their mother. The dominant male, a beautiful black-maned Lion named Blacky is resting on the banks of the Talek river a hundred meters away. I look behind me towards the west, where the sun is sinking behind a thin layer of clouds, and I see a Lioness walking across the plains away from the bushes. Through the binoculars I can see that she is carrying a baby in her mouth, probably to a new den. I drive around the bushes to reach her. The cub keeps the eyes closed and shakes its legs. It does not seem to be particularly happy to be carried this way. But the mother's grip, though delicate, is also quite strong. She walks a couple of kilometers up a slope and then down, across a gulley. She looks ahead in search for danger. It's dark when she finally stops by a line of bushes along a very small stream. It will be her den for the coming days. The late morning sun beats hard on the plains above the Mara River. 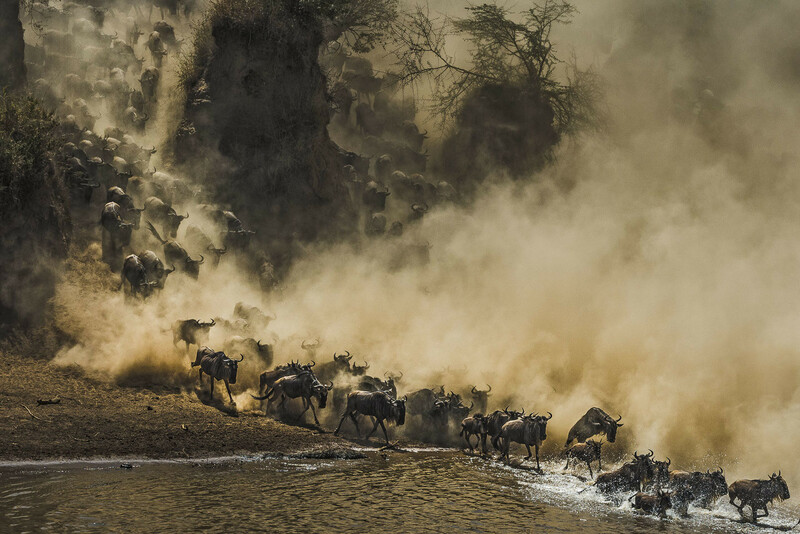 From the southern side of the river thousands of Wildebeests are descending towards the edge of the banks. They stop and look down. The banks below them are steep; the water is raging and wide. There are rapids, rocks, even steeper banks on the opposite side. And even scarier, there are several huge Crocodiles that have been waiting for this moment for many months now. They are lurking just below the water surface, downstream from where the animals want to cross. Time goes by. More animals descend from the hills and mass up together behind the ones in the front. 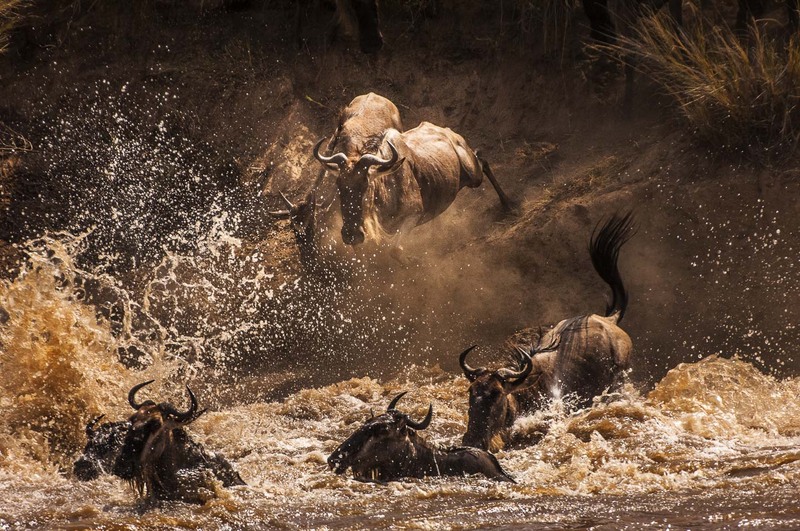 Suddenly some Wildebeests run to the right, looking for another access point to the river. Some descend cautiously to the water’s edge; they touch the water with their lips. It is impossible for us to understand the complexity of factors that contribute to halting or starting a crossing. The animals near the river catch a movement in the water. They rush back up the banks raising clouds of dust. Their repetitive grunting calls fill the air. It’s a cacophony of sounds, and tension builds up. Some animals in the back rows are pulling away from the river and beginning to graze. Then one cow Wildebeest returns to the river’s edge and bravely steps into the water, followed by her calf. They start swimming. A few more scattered animals enter the water as well. 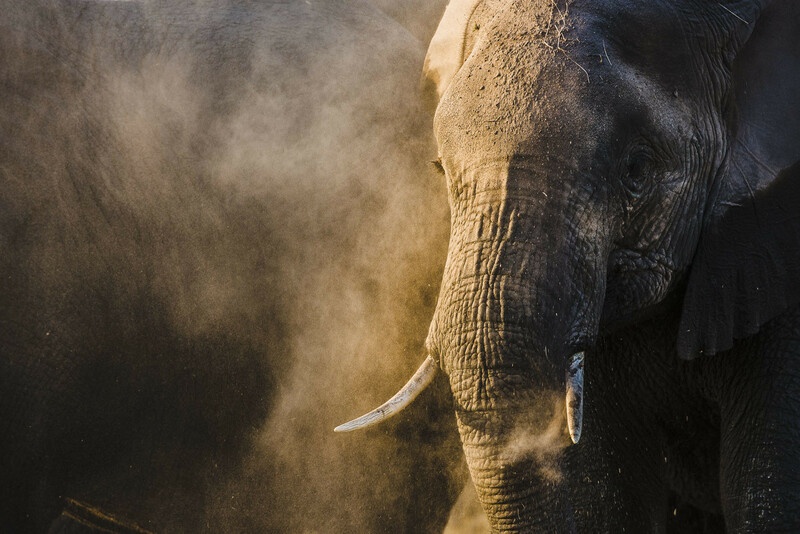 The ones on the banks hurry down, in huge clouds of dust. All of a sudden is total pandemonium. The chaos of the crossing is unbelievable. 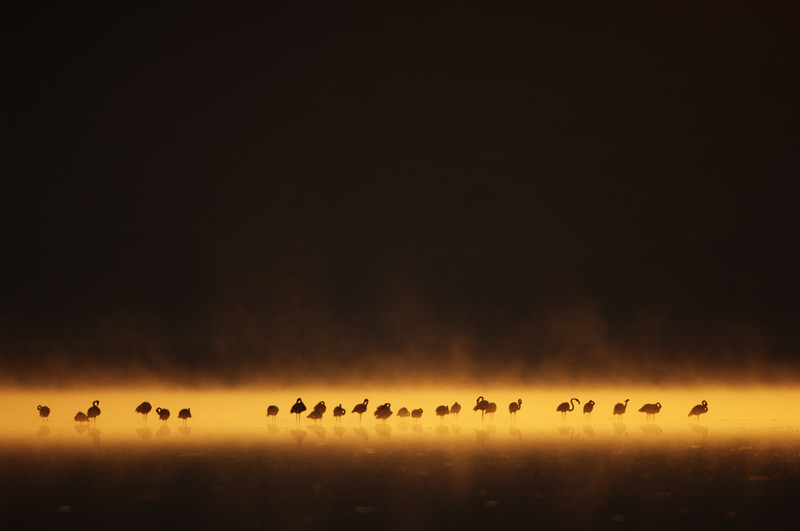 Thousands of animals plunge into the river at once. For a few minutes the cloud of dust is so big that it’s impossible to see anything. The first Wildebeests are starting to climb successfully to the other side. More and more get in the water, spreading out as the current pushes them downstream. The Crocodiles are patiently waiting for the initial frenzy to cool down. It’s one of the most extraordinary natural spectacles on earth. 20" x 30", 30" x 40", 40" x 60", 60" x 80"
At the heart of the endless plains of the Serengeti, ancient rocky outcrops rise like islands in a sea of grass. They are known as kopjes. They provide shade, shelter and water to many species of animals. I drive through this timeless landscape. Each rock has been eroded for millions of years by wind and water, to produce shapes that look like sculptures. A Barn Owl looks down from its roosting place in a crevice among the rocks. A Martial Eagle rests in the shade of an Acacia at the base of another outcrop. From an elevated point scanning the plains with the binocular I spot three male Lions walking through the golden grass right when the sun is appearing on the horizon. I descend on the rugged track towards them. When I reach them one of the three has laid down in the grass. He starts roaring with unbelievable intensity, extending his muzzle as the sound fills the air and clouds of vapor lit up by the low light dissolve in the cold air. The low frequency of his roars vibrate in my chest, it's an unforgettable moment. All around the plains are flooded by the sun's first rays. The other two males keep walking towards a kopje where they find the Lionesses. They'll remain there resting until the sun will be low again on the horizon.